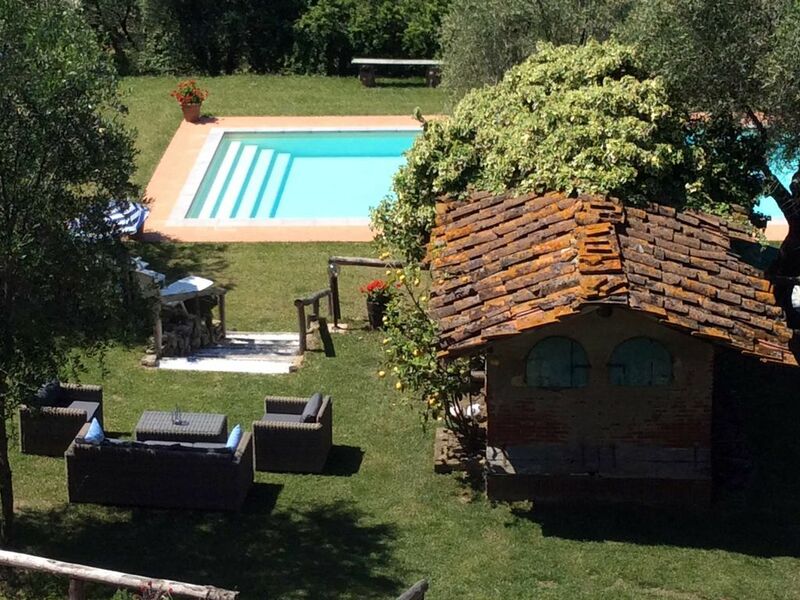 4 bedrooms, 2 bathrooms, 2 kitchens, seperate ground floor studio level, private pool and garden, 10-15 Mins From Lucca. Great reviews. We are from and live in the UK, but have family in Lucca. After several years of searching for the right property we came across this country farmhouse. It had everything we were looking for, the fantastic views, tranquillity, great position, close to local amenities and Lucca. We fell in love with it instantly, though the house needed a little updating, so the renovations began. We've spent as much time as we can over the past few years putting our own stamp on the house and have now become very attached to the property. Its now part of our soul and we like to spend as much time there as we can. We've attempted to make the house feel like a home from home. The lounge consists of a 3 piece suite. 37 inch flat screen TV, xbox360. A media centre for movies and Internet TV. A music system allowing your phones, tablets to connect via a 3.5mm socket. The dinning room table can be extended allowing 8 to be seated. Induction hob, oven, microwave, dishwasher, fridge freezer, Gagia coffee machine, toaster, kettle. Outside: The garden is tiered on several levels, south facing, with spectacular views from all angles. The garden has an abundance of fruit trees with oranges, figs, lemons, plums, apples, sharon fruit and olives all ripening at different times throughout the year. The pool is new, large at 12 x 5 metres in size. The pool cleaning system is saltwater based, considered to be more natural, healthy and environmentally friendly. The pool is regularly maintained to ensure a safe ph value. There is also a BBQ and seating area, sunbeds and hammock. Cleaning / Towels / Linen / Maid service: the property is cleaned weekly on change over day. Linens and towels are included. Other: The study contains a laptop and printer with Internet access for your use. Here you will also find a sofa bed. In short words - if you can afford it, look no further! The owner and the property manager were both very helpful and provided a lot of useful information. The villa speaks for itself - well maintained, just a short drive from Lucca and Pisa airport, and equiped with a lot of stuff to keep you entertained during your stay. Plus breathtaking views over the city of Lucca. Highly recommended! The views from the villa are stunning. It is clean, well-run and the pool and gardens are perfect to relax in. We had a lovely week. There are lots of thoughtful touches and properly laundered sheets and towels. We could not have been happier. It was more beautiful than the pictures on the website. Casa Collina Verde was perfectly located in the hills above Luca with stunning views and surrounded by olive trees and vineyards. The villa was extremely clean and the grounds well cared for. The pool was almost brand new. The property manager Philip was helpful courteous and went far and beyond our expectations. He organized a private chef to cook for us amongst several other favours. We have travelled extensively all over the world and this was one of our best trips. We will be back. John and Michelle. A very well appointed house with wonderful garden and pool and simply stunning views. Perfect place to explore Tuscany or simply relax ! We have just enjoyed another wonderful week at this thoughtfully furnished holiday villa located on the Tuscan hills overlooking the spectacular Roman walled city, Lucca. This is our 3rd return to Casa Collina Verde and each time feels like the first. This is the perfect place to escape for a few days and we have not yet been disappointed. The villa is so comfortable and the setting amongst olive groves cannot be surpassed. The owners have put a lot of thought into making it a home from home . This area of Tuscany is rich in culture and fascinating places to visit. However for a relaxing break you don't really need to leave the villa - we spent most of our time in the warm summer sun relaxing around the large outdoor pool where the owners have recently added a pagoda folly providing a great place to read or snooze in the shade with a nice glass of chilled local wine. We will certainly return to Casa Collina Verde again - next time we might even try 'out of season' when the pool is not so much of a draw as there is so much we have yet to explore in the area. A perfect villa in all ways,everthing you want . vey helpful,would recommend to any family to stay. The close beach town in Viareggio which is approximately 30 minutes away by car. Pisa is 40 minutes by car. Booking Notes: A 25% booking deposit is required at the time of booking with the remaining balance due 8 weeks prior to arrival. Deposit and final payment is via bank transfer or paypal. Changeover Day: During high season arrival after 4.00 pm Saturday through Saturday and departure by 10.00am. However, we can be more flexible during low season. Notes on prices: Prices include exclusive use of the house, garden and pool for up to 10 persons for one week on a self catering basis.